Now you can splash more vibrant colors across stages and walls, in a greater variety of color schemes, with the new Mega Bar RGBA from ADJ. 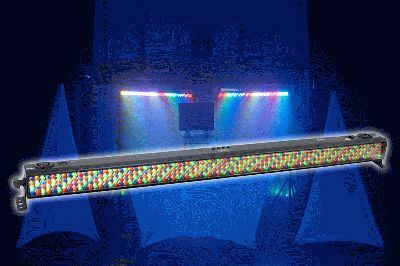 A cutting-edge one-meter (42-inch) LED wash bar, the Mega Bar RGBA can create a limitless spectrum of stunning colors with its 320 x 10mm RGBA LEDs (64 red, 96 green, 96 blue and 64 amber). The addition of amber LEDs provides the ability to produce hard-to-blend – yet very desirable --orange, yellow and gold shades. These added color options give you more design flexibility, plus amber adds a richer, warmer glow to all colors, so your wall and stage washes will have a depth and intensity that makes them really stand out. Ideal for nightclubs, mobile entertainers, bands, theatrical productions, and any uplighting or color washing application, the compact Mega Bar RGBA also offers the flexibility of a variety of manual and DMX modes to suit users with different needs and levels of lighting experience. Equipped with 48 built-in color macros, it can be run in 6 different modes: Manual Color Mode, Static Color Change Mode, Auto (Program Run) Mode, Sound Active Mode, RGBA Manual Control Mode, and DMX-512 Mode (with 4, 6, 7, 9, 10, 18 or 34-channel DMX options). You can even control your washes at a distance from behind the scenes, because the Mega Bar RGBA is compatible with the optional ADJ RFC wireless remote (sold separately), which gives command over Black Out, program selection, RGB color change and other features. Need to cover a larger area? The Mega Bar RGBA can be linked in multiples via 3-pin XLR cable. It features an IEC AC outlet on the rear to daisy chain power for up to 20 units, and it even has a cool new magnet system on the endcaps for easily connecting multiple bars together to seamlessly expand your lighting coverage. “Whether you’re a mobile entertainer or experienced lighting pro, the Mega Bar RGBA makes it easier than ever to create professional LED washes and uplighting effects—whatever your needs,” said Alfred Gonzales, national sales manager for ADJ. “Not only can it be operated and controlled in so many different ways, but the amber LEDs give you an expanded color palette --and a richer looking wash that people will really notice.” Featuring a 30° beam angle, the Mega Bar RGBA also includes 0-100% electronic dimming and an LED strobe/pulse effect for even more design options. The Mega Bar RGBA comes with a versatile mounting bracket that allows it to be hung on a wall or set on the ground. Its compact size – 41.75”L x 3”W x 5.75”H (1060 x 73 x 14mm) – and light weight – 6 lbs. (2.7 kg.) –make it ideal for mobile use too. Energy-efficient and low maintenance, the Mega Bar RGBA draws a maximum 32 watts of power and utilizes 50,000-hour rated LEDs. It emits very little heat and can be run all night without duty cycles. It features multi-voltage operation: 100-240V, 50/60Hz. The MSRP of the Mega Bar RGBA is $349.95.